The objective of this project is to improve the accuracy of measurement of the proportions and symmetry of polished diamonds. 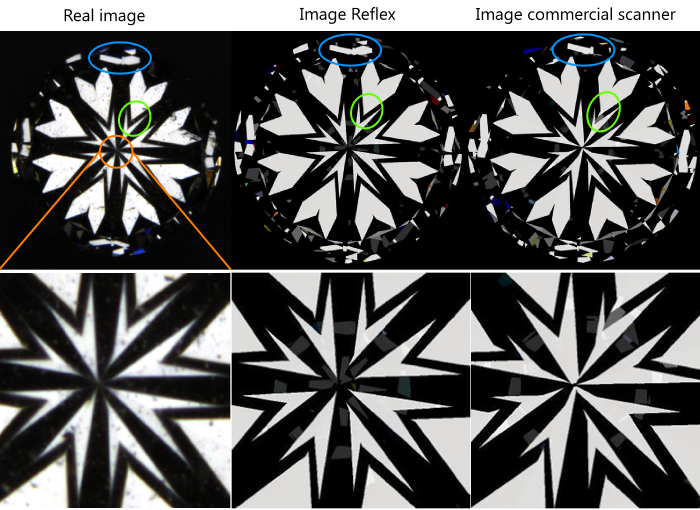 The commercially available systems for measuring the proportions of polished stones all use a projection of the profile (shadow method) to scan the diamond. The diamond is rotated between a telecentric light source and a telecentric lens. The contour of the shadow of the diamond is then analyzed in a computer to determine its proportions. This method has some typical disadvantages concerning accuracy. The ultimate objective of this project was to build a system with much higher accuracy than the existing systems by using other methods different from the shadow method. The real image shows two incomplete arrows. This is caused by an internal defectin the crystal lattice, called a glets. This is not visible in the simulated images because they are based on the external characteristics only. 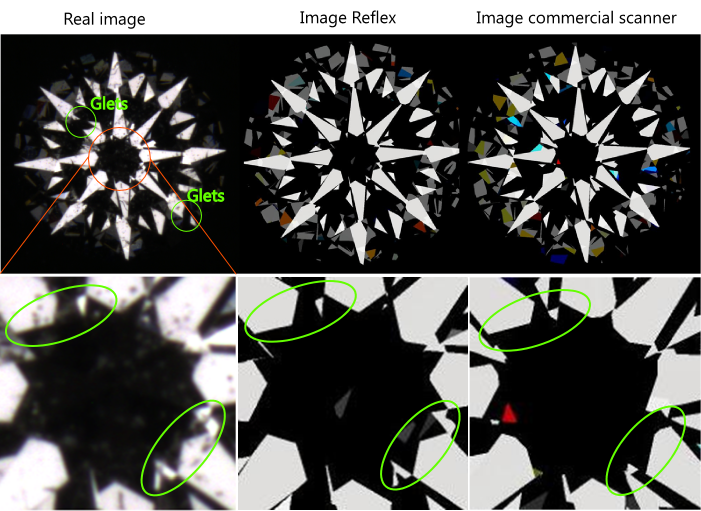 The center of the images is enlarged to visualize the differences between the measurements. 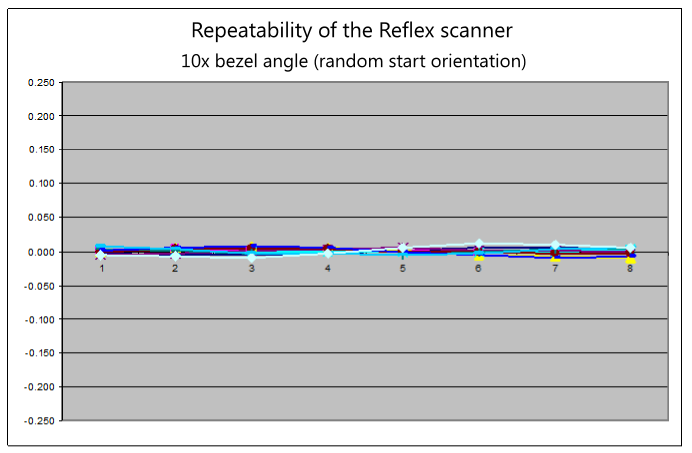 It is clear that the model build with Reflex data is far more accurate than the one build from the data of the commercial scanner. The heart side reveals following pictures: The blue and green markers show some differences in the hart and surrounding patterns. The middle is enlarged to show the importance of a high accuracy measurement. For less time critical applications like calibration the device is already suitable. Also the possibility for a future as "proportions referee" is now being investigated. Experiments have shown that higher accuracies are possible. 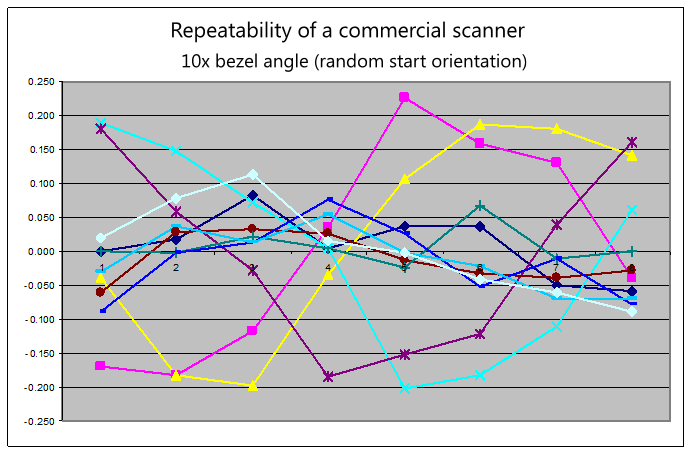 Angles (both inclination and index) can be measured with accuracies up to ±0.02º. The distances can be measured with submicron accuracy. A prototype is being evaluated.